Home › Energy-Efficient LED Lighting › Battery Operated String Led Fairy Lights Outdoor Bright White Amars 33 Feet G.. Battery Operated String Led Fairy Lights Outdoor Bright White Amars 33 Feet G.. Battery powered LED fairy lights for outdoor, indoor, wedding, party, bedroom decorative lighting. LED numbers: 80pcs bright mini led bulbs; Color: bright white. Work modes: flash and steady ON. For battery operated led string lights, we abandon some specious functions to pay more attention to its quality, such as color saturation, brightness, solution lumens depreciation etc. Transparent white battery box, very easy to hide; powered by 3pcs AA batteries(not included). Improved brightness as long as ten meters from begin to end. Amazing decoration lighting effect; more pleasant for eyes. This lights is provided by AMARS exclusively and 180 days warranty and 24/7 customer support. AMARS is a registreted brand in US. AMARS(R) is the only authoriesd seller to sell AMARS brand products. Color:Cool White AMARS LED Battery Fairy Lights - To Light Up YourCelebration; They make your home and garden loonk fantastic at night.LightEffect: 1. Steady on 2. 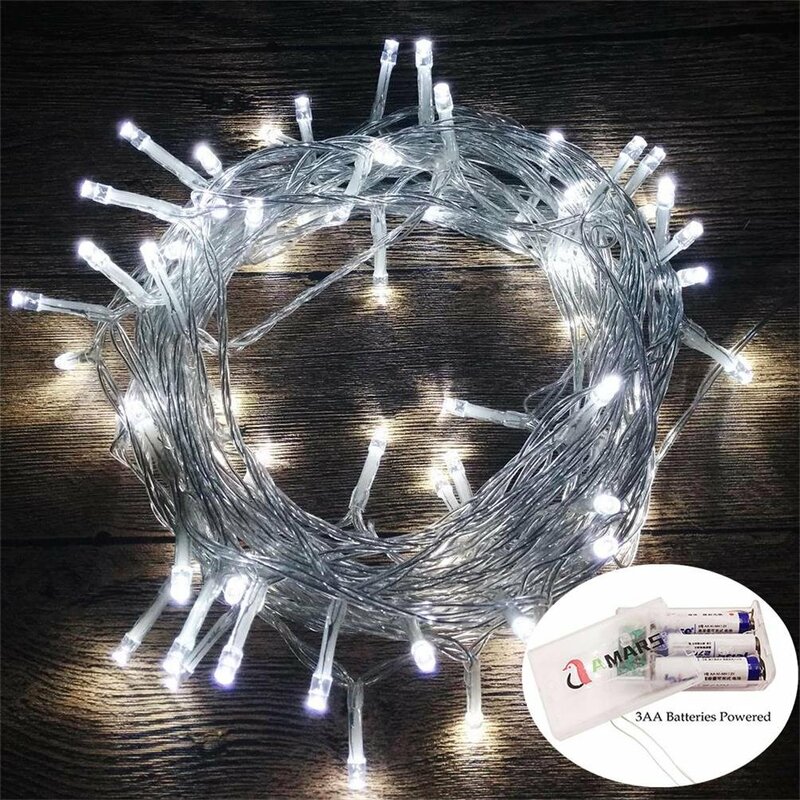 Flash3.OFF Features: Lights Colour: bright white -Number of LED Bulbs: 80 LED String Length: 10 meters/33ft Powered by 3 ofAA batteries (not included) Perfect for Christmas, weddings, party,celebration, garden, kicthen, bedroom and etc. Waterproof Level: IP44, canbe used for outdoor[please don't soak the lights into rain and water directlyand give some protection to the battery box when use outside]. About 180 DaysAMARS Warranty: AMARS stands behind all of its products 100%. If you are notsatisfied with the lights, please feel free to contact us. We ensure 100%customer satisfaction. Package Included: 1 x AMARS 10M 80 Led WaterproofBattery Fairy Lights Tips: 1. The Waterproof Led Fairy lights can resist towet environment but please don't soak into the water directly. 2. The lightsworking time and brightness depend on the performance of the battery, wesuggest to select high quality chargeable batteries.